After imposing Article 155 of the Spanish Constitution to suspend Catalonia’s elected government last week, Spain, backed by the European Union (EU), is rapidly moving towards a military regime. As High Court judge Carmen Lamela remanded into custody eight ministers of the Catalan regional government, Spanish armed forces chief General Fernando Alejandre threatened yesterday to attack Catalonia. From Brussels, where he fled to escape prosecution by Spanish authorities, deposed Catalan regional premier Carles Puigdemont appealed yesterday for the European Union to intervene in the secession crisis. 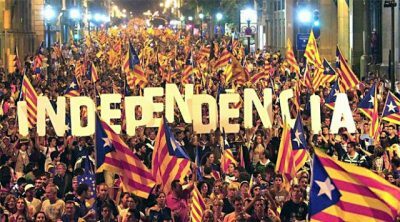 Last week, Madrid invoked Article 155 of the Spanish Constitution to impose an unelected regime in Catalonia in response to the October 1 Catalan independence referendum. Now Puigdemont is asking the EU to broker a deal between the Popular Party government in Madrid and the ousted Catalan authorities. In a menacing speech to the Spanish Congress on Wednesday, Popular Party (PP) Prime Minister Mariano Rajoy stated that, in response to Catalan regional Premier Carles Puigdemont’s speech affirming the October 1 independence referendum, he was preparing to invoke Article 155 of the Spanish Constitution. This provision allows Madrid to suspend the authority of the Catalan regional government and seize control of the region’s finances and administration. Speaking Tuesday evening before the Catalan parliament in Barcelona, regional premier Carles Puigdemont announced that Catalonia would secede from Spain, in line with the result of the October 1 Catalan independence referendum. However, he put off a formal declaration of independence for now and requested negotiations with the central government in Madrid. The Popular Party (PP) government of Prime Minister Mariano Rajoy has declared the referendum illegal and treasonous and ruled out talks with Puigdemont. 1. 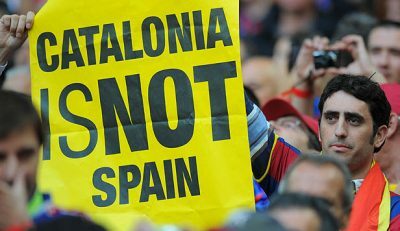 Either the secessionist wave mobilizing hundreds of thousands in Catalonia is being generated by the conflicts and antagonisms intrinsic to capitalism in general as expressed in the particular conflicts and antagonisms embedded in the capitalist relations of Catalonia with the rest of Spain, or…or nothing, because then the critique of capital, and historical materialism have nothing to say.